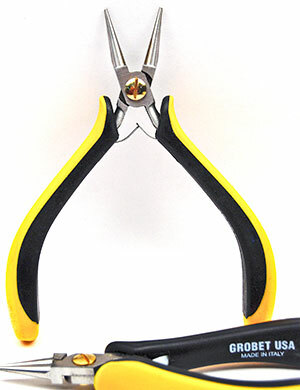 Click Here to go to our Specialty Pliers page. 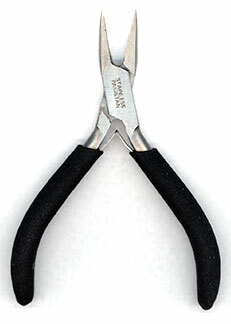 These drop forged steel pliers with tungsten steel are 100% rust protected and acid resistant. 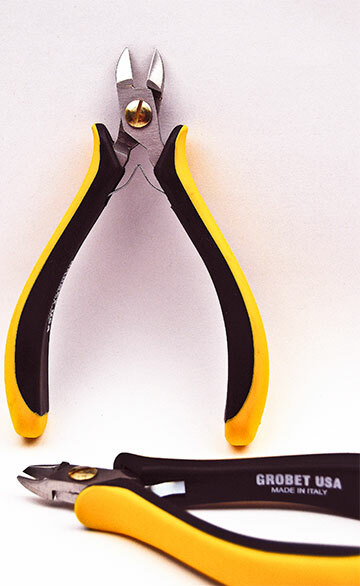 The pliers are ergonomically developed with an adjustable screw joint, with foam padded handlesfor fatigue free working conditions. 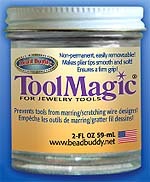 TOOL MAGIC ï¿½ for jewelry tools - 2 fl. oz. 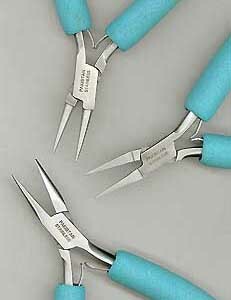 or to create a comfortable grip for pliers handles. This item ships only by UPS Ground. Made of blue vinyl backed canvas, this pouch has elastic strips to hold your tools in place. It zips around three sides so nothing can fall out. *Similar to the jaw size of our expensive Linstroms! Includes a Matching Purple Leather Case! 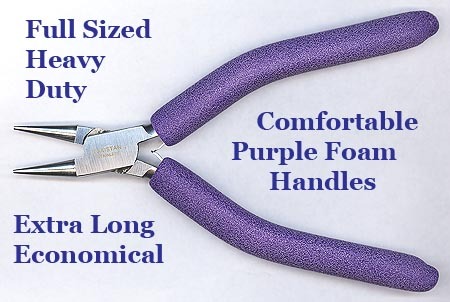 Chain Nose Pliers - 4-7\8"
Round Nose Pliers - 4-7\8"
Flat Nose Pliers - 4-7\8"
soft foam coated handles and a smooth, well ground finish. Made in Pakistan. 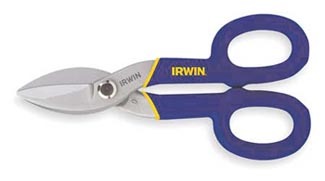 A nice inexpensive plier that will handle many jobs. are suitable for all smaller gauge wires and sheet metal. Grobet - Made in Germany. Micro Bevel. Nearly flush cut. Box joint. 4-3/4 inches long. Spring return. 1. Finely finished with a high degree of symmetry, even under magnification. 4. 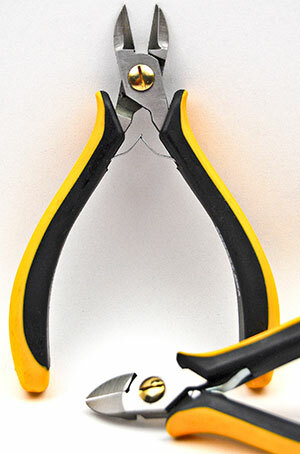 Return spring automatically opens Rx pliers to do the job. SHARP TIP? MICRO BEVEL? FLUSH CUT? ULTRA FLUSH CUT? 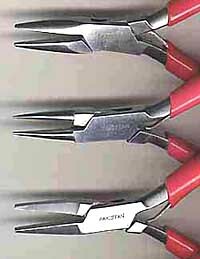 Side cutters are more durable with more 'meat' behind the tip and under the cutting edge. The more flush the cut and the sharper the edge and tip, the more quickly cutters dull. More bevel on the 'flush' side of the jaws strengthens & lengthens sharp edge life. 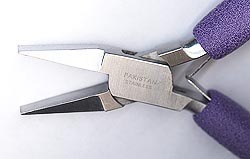 That is why "micro bevel" is offered on most precision side cut pliers. Less point, with more 'meat' behind the blade tips in the form of a curve lengthens tip life. 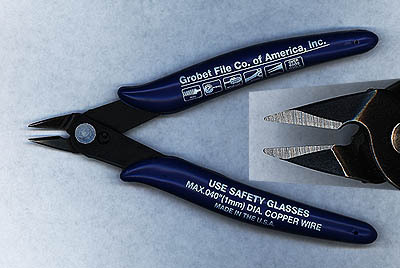 Flush cut jaws are not intend nor recommended for cutting hard stainless steel cable. honed and feature comfortable ergonomic grips. The round nose version's jaws are extremely small. All are precision ground for those tiny and delicate loops. Made in Spain since 2011. 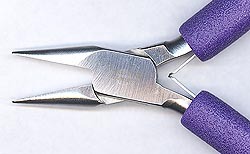 This craft cutter is perfect for cutting soft wires and thread. 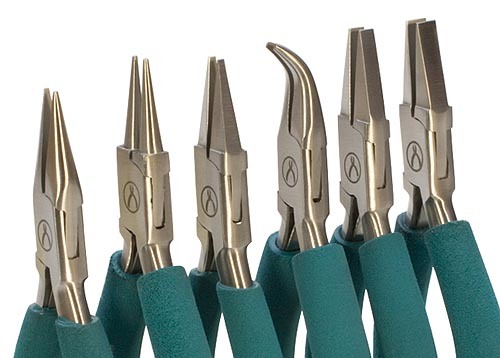 Don't ruin your expensive Lindstrom cutters using them on hard stainless cable. soft rubber handles, spring return and a sharp, slightly angled cutting head. 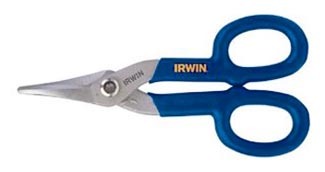 They are a great all around smooth cutting light gauge wire nipper. 5 " SIDE CUTTERS EURO-TOOL Made in Germany. These pliers can do a lot more than helping to make bails! 2.5 mm diameter round jaw - for use with 20 gauge or finer wire. 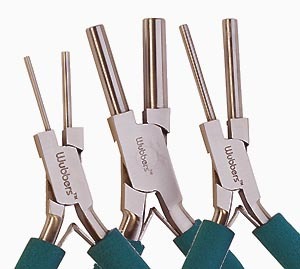 With the Wubbers Looping Pliers, you will be able to make perfect eye pins quickly and effortlessly. They enable you to "break the neck" (center your loop over the wire) without distorting your loop in the least. 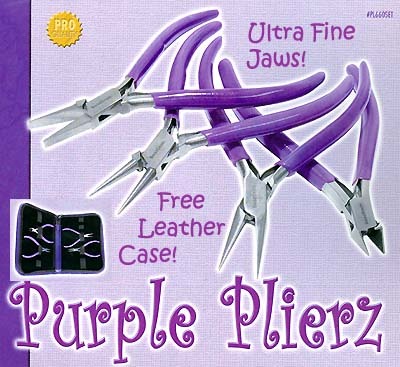 Learn more at www.Wubbers.com by watching Wubbers' Wire Looping Pliers instructional video! Made in Germany. FULL SIZE metal smith's pliers with smooth jaw faces. 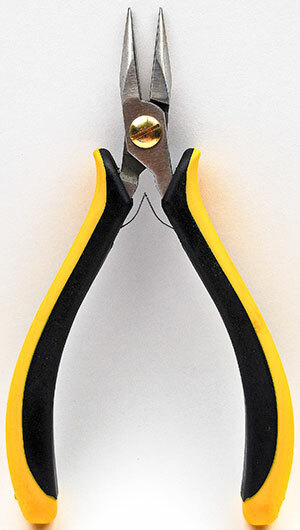 Strong, box joint pliers with a very smooth finish plus rubber dipped handles . 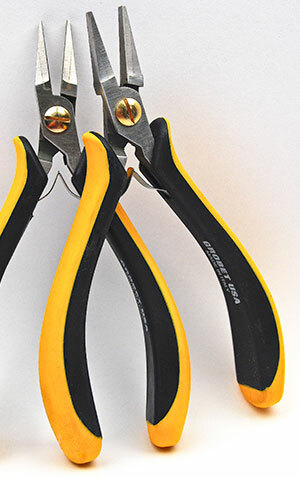 These professional grade pliers are suitable for all light through heavy gauge precious and base metals. Box Joint. Tapered 1-1/8 inch round jaws. For wire bending and looping. Tapered half round jaws for general all-around work. Box Joint. Tapered and bent down chain nose jaws. For those awkward and/or hard to hold positions. Box Joint. Sturdy flat nose with one inch long jaws. Especially good for holding rows of wire and bending sheet.